Are you searching for a new colorful popular widget for the blogger!This article will surely add a new and colored popular post.The widget blogger provides with itself is not an advanced as this new poplar post widget is.Poplar post widget has many options to show the post of the recent popularity.You can choose 7 days most visited post grouping,monthly most visited grouping and all time most visited grouping. Show Snippet-This feature show few lines of the post along with the title of the post.This should be enabled in case you have enabled the next options also otherwise it does not look good. Show Thumbnail-Thumbnail is the small/miniature image that is present inside the post.This is also another SEO tool as it increases the HTML Vs. Text ratio. If I am not wrong this is a widget of the wordpress.But in wordpress this widget also show the number of the visits to that post.But in the blogger you do not enjoy that feature.Many new templates are implementing this new popular post widget.Even I have seen this widget on some famous sites. Why To Choose This Widget? This new post widget will definitely attract the visitors due to its color combination.It`s eye catching power is a main reason to use it. Easy To Use as you don`t need to look HTML code each time.You can easily change the settings from the page elements. Bloggers can easily implement them by little knowledge about the HTML.Don`t worry I am here to help you.Here are the steps just follow each step. 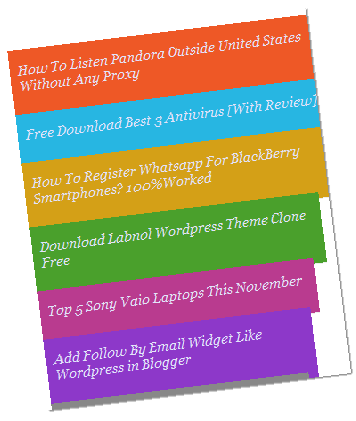 Before you start adding the new widget , add the old Popular Widget That Blogger provide you. Search of Popular Post Widget and add that. Open Your Blogger Dashboard ,Select your blog. Add the below code before </head> tag. Change it with the below code.